Puget Sound is best distinguished from other large American estuaries by the pervasive influence of the last glaciation. This glacial legacy includes a steep, irregular coastline, an abundance of coarse-grained sediment, and a shoreline dominated by coastal bluffs. These bluffs are inherently erosional landforms, although the rate and character of this erosion varies greatly. Bluffs are a key component of a dynamic beach system that supports an incredible array of coastal landforms and environments, including spits and small estuaries. This talk will draw on local examples to show how geologic processes have shaped the modern shoreline and how they continue to do so – sometimes with significant implications for people who live near the shore. The talk will also include observations on how geology is becoming increasingly important to our thinking about how we protect Puget Sound’s shorelines. 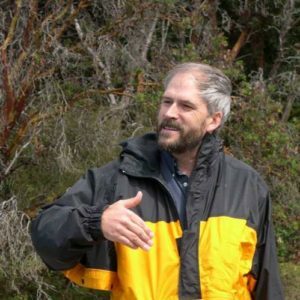 Hugh has been a geologist with the Shorelands Program at the Washington Department of Ecology since 1989. His interests include coastal erosion, geologic hazards, and the environmental impacts of shoreline modifications. Hugh grew up near the coast of Maine but moved to the Puget Sound region in 1983.